We use sketching to solve problems, tell stories & explain ideas. And we can teach you to do the same. Find out more, get a free quote, or call us on 1300 SKETCH. Our talented team of copywriters, illustrators, and animators bring their own unique style to every project, underpinned by our tried-and-tested approach to telling visual stories (we call it our Sketchosophy™). The end result is the best possible visual to get your message heard. If you have a story to tell, we can bring it to life. The National Museum of Australia engaged Sketch Group to animate a series of "defining moments" in Australia's history. From the gold rush of the early 1800s to women's suffrage, Australia's good ol' days have never been brought to life with such humour. It was a beautiful, sunny day to be outside and sketch the Mount Alexander Shire Safety Awareness Field Exercise, teaching primary school children how to be safe around fire, at home, on your bike ... anywhere! We had loads of fun creating this series of short videos depicting "tradie hacks" for VELCRO®. There are eight hilarious videos in total, showing how different VELCRO® brand products can help tradies be organised, safe, and on top of their tools. 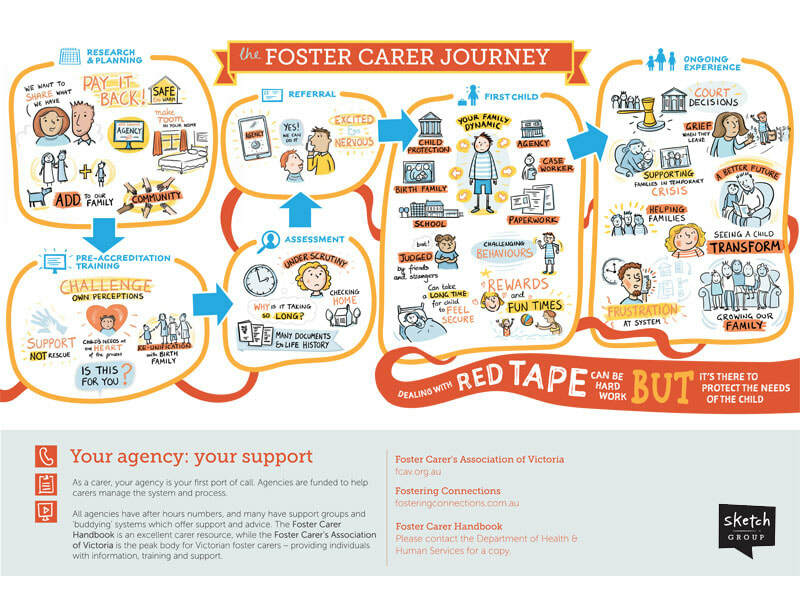 Illustrating the Foster Carer Journey for the Department of Health & Human Services, in association with the Foster Carer's Association of Victoria, is one of the most rewarding projects we've ever tackled. What can you use a sketch video for? We're experts at taking the complex and making it simple. Bring your story to life with an explainer video. Create training videos that your team will actually enjoy watching. Now you can bring everyone up to speed. We'll find your unique story, and tell it in a way that drives signups, increases awareness, or changes behaviour.